The Whitney Point Fall Festival will be held on Saturday, October 28th. The planning committee is pleased to share this year’s entertainment line-up. There is something for everyone. Check the schedule in this paper and on whitneypointfallfestival.org for times and venues so you don’t miss out! Doug Rougeux. 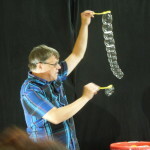 Rougeux, better known as ” The Bubble Man”, is returning to the festival this year. He takes bubble making to an entirely new level. He uses wands, straws, his bare hands, and his “Super-Duper Bubble Hoop” to create bubbles. He can make kissing bubbles, attacking bubbles, tight-rope walking bubbles, spaceship bubbles, popcorn bubbles, bubble chains, and bubbles dancing to music. He can even make a bubble with a person inside. Rougeux uses elements of clowning, mime, slapstick, juggling, and magic to enhance his bubblery. Rouguex will be at this year’s festival with a bubble exploration and play area in the TRA cafeteria. He will also delight audiences with two special performances at 11:00 and 1:00. Sure to be fun for the whole family! Also returning to the entertainment line-up this year is comedy ventriloquist and puppet master, Sylvia Fletcher. She has been performing professionally for about 15 years, bringing her act to theaters, resorts, schools, fairs, corporations, cruise ships, and other venues to the delight of the young and young at heart. Sylvia tours throughout the world with the Magic Trunk, a well traveled box inhabited by a bunch of quick-witted puppets and inanimate objects that she comically brings to life. She will dazzle you with her amazing talent, lively unforgettable characters, and voice illusions. Sylvia’s show at 2:00 in the TRA Auditorium is sure to delight the entire family. This year’s Fall Festival entertainment will also include some returning favorites. Kevin LaDue of LaDue Music Company, Whitney Point, will share acoustic guitar music and vocals in the TRA gymnasium as part of the Craft Fair from 10:30 – 11:30. 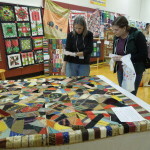 As you enjoy the Triangle Quilt Guild’s quilt display in the “little gym” you will be treated to two musical delights. Curt Osgood will be sharing his hammer dulcimer music from 9:30 – 11:30 and Meredith Kohn Bocek of The Harp Studio in Apalachin, New York, will play from 12:00 – 2:00. Animal Adventure of Harpursville will be at the festival for an expanded time this year from 10:00 – 1:00. Animal Adventure will bring a variety of reptiles, invertebrates, small animals, and exotics. They provide hands-on educational animal facts and fun. (Animal Adventure is sponsored by Levene, Gouldin, and Thompson, LLP.) The Stoutmen will be performing at Sparky’s Pub and Grill at the Oakland Hotel from 5:00 – 8:00. Their strong, straightforward singing of traditional songs is in the style of the Clancy Brothers & Tommy Makem, Dubliners, and Wolf Tones. They present a great mix of powerful rebel songs, jovial drinking songs, toe-tapping reels and beautiful Irish ballads. The planning committee encourages you to take advantage of these great free entertainment opportunities and to enjoy other Fall Festival events.